This article is the first in a series of articles that provide simple overviews of the Bible’s teachings on basic doctrinal issues. Although there are many places we could begin, we will start with the nature or attributes (characteristics) of God. While concepts of God are not central to every religion (for example, it is of marginal relevance in Buddhism and Confucianism), the nature of God is of fundamental, primary importance in Christianity. The word god, especially when not capitalized in English, can refer to a variety of supernatural beings real or imagined, but in Christian doctrine God is normally used as a name or designation for the Supreme Being. In this context, there is one and only one God. The Bible repeatedly affirms in many ways that there is one God (Deut. 4:35, 39; 6:4; 32:39; 2 Sam. 22:32; 2 Chron. 15:3; Is. 37:20; 43:10; 44:6-8; 45:21-22; 46:9; Jer. 10:10; John 17:3; Rom. 3:30; 16:27; 1 Cor. 8:4; 12:6; Gal. 3:20; Eph. 4:6; 1 Thess. 1:9; 1 Tim. 1:17; 2:5; James 2:19; 1 John 5:20; Jude 25). What this means is that there is one being that is the proper object of religious faith, devotion, worship, reverence (or fear), and prayer (Gen. 15:6; Exod. 20:2-6; 24:14; Deut. 5:6-10; 6:4-5, 13; 13:6-11; 1 Chron. 16:8, 23; 29:10-11; Ps. 29:1-3; 65:2; 72:18-19; Prov. 1:7; 9:10; Isa. 8:12-13; 28:16; 43:10; Joel 2:32; Matt. 22:37; Mark 11:22; Rom. 11:36; Heb. 6:1). This being that the Bible calls the one true God is given such exclusive honor because he alone is the creator, maker, sustainer, and ruler of all things. Again, this is a dominant theme throughout the Bible (Gen. 1:1-31; Exod. 14:21; Neh. 9:6; Job 38:8-11; Ps. 33:6; 74:13-14; 77:16-20; 95:5-7; 102:25-27; 104:4-9, 24-30; 107:23-30; Isa. 40:28; 42:5; 44:24; Jer. 10:16; 51:19; Acts 4:24; 14:15; 17:25, 28; Rom. 1:25; 4:17; 11:36; Heb. 2:10; 1 Peter 4:19; Rev. 4:11). These passages consistently distinguish between God the creator and everything he created. This “Creator-creation” distinction is basic to everything the Bible teaches about the nature of God. According to the Bible, God is a personal being—someone who is self-aware, who makes choices and initiates actions, and who is capable of relationship with other persons (including angels and human beings). Citing proof texts on this point is almost superfluous. Scripture everywhere assumes the personhood of God in the use of personal pronouns for God, in recording him speaking and acting willfully (e.g., Gen. 1:3, 26; Heb. 1:1-2). He has a name, Yahweh (Jehovah, often translated “the Lord”), and says of himself, “I am who I am” (Exod. 3:14). The Bible speaks of God as maker and craftsman, lord and master, father and shepherd. As a perfect personal being, God has every moral perfection: he is good, holy, righteous, truthful, and loving (e.g., Gen. 1:31; Lev. 19:2; Deut. 7:7-8; Ps. 5:4-6; 118:1; Isa. 6:3; Jer. 31:3; Hab. 1:12-13; Mark 10:18; John 3:16; 17:17; Rom. 8:28; Titus 1:2; Heb. 6:18; 12:6; 1 Peter 1:14-19). Already from what we have seen in the Bible, a number of beliefs found in various religions are clearly incompatible with Christian doctrine. Polytheism is the belief in many gods that rule different parts of the world or that must cooperate to govern the world. Pantheism is the belief that God is all that exists—which means that the material world is part of God or a manifestation of God, or that it is an illusion. Against these popular notions, the Bible teaches monotheism, the doctrine that one God made, sustains, and rules over everything that exists. From the fact that everything that has ever come into existence was brought into existence by God (see John 1:3), it follows that God himself is uncreated and has no beginning or end to his existence (Gen. 1:1; Ps. 90:2; 93:2; 102:12, 25-27; Isa. 43:10; 1 Tim. 1:17). Far from having a beginning or end, God is “the beginning and the end,” “the first and the last,” meaning that everything finds its origin and goal in God (Isa. 41:4; 44:6; 48:12; Rev. 1:8, 17; 2:8; 3:14; 21:6; 22:13). Time therefore does not limit God in the way that it limits creatures (e.g., Ps. 90:4; 2 Peter 3:8). The traditional term for this characteristic of God is eternal. Another way of looking at this same idea about God is that he is self-existent, meaning that his existence depends on no one and nothing outside himself. That God is self-existent is implicit in his declaration to Moses at the burning bush already quoted, “I am who I am” (Exod. 3:14). Three other characteristics of God associated directly with the fact that he is the maker of everything that exists other than himself are known as the “omni” attributes of God. (Omni is Latin for “all.”) First, God is omnipotent, or all-powerful, meaning that God is unlimited in his ability to do anything consistent with the perfection of his own being. It does not mean that God can do things that are self-contradictory (such as making two plus two equal thirteen, or making a rock he cannot move) or immoral (such as lying, 2 Tim. 2:13; Titus 1:2; Heb. 6:18; James 1:13). 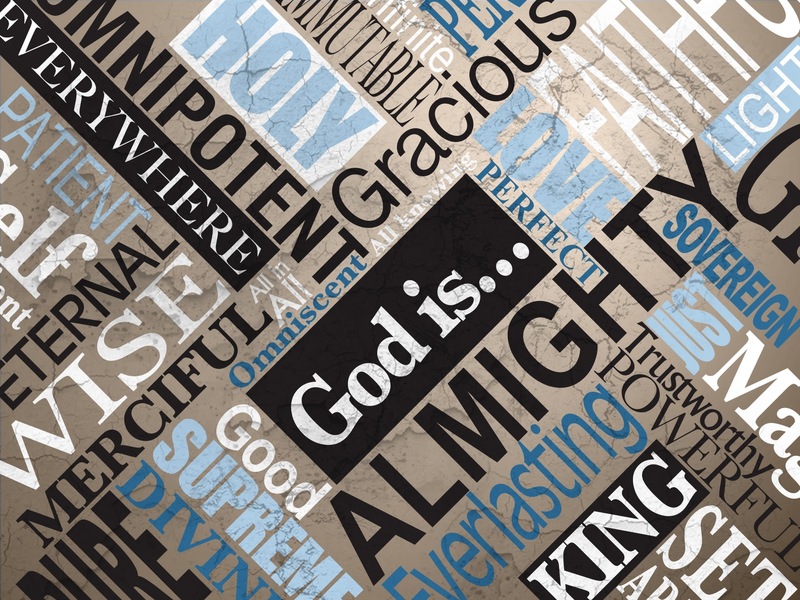 With these qualifications in mind, the Bible clearly teaches God’s omnipotence. He is the Almighty (Job 40:2; Rev. 1:8; etc.). All things are possible for God (Job 42:2; Ps. 115:3; Matt. 19:26; Mark 10:27; Luke 1:37; 18:27; Eph. 1:11), and nothing is too difficult for him (Gen. 18:24; Jer. 32:17, 27; Zech. 8:6; Matt. 3:9). Since God is the source of all power in the universe (having brought it into existence as an act of his will), he is literally all-powerful. Second, God is omniscient, or all-knowing. God perfectly knows everything (Job 37:16). This includes knowing the seemingly most insignificant minutiae (Matt. 10:30), knowing what is in people’s hearts (1 Sam. 16:7; 1 Kings 8:39; Ps. 44:21; 1 Chron. 28:9, 17; Ps. 139:1-4; Jer. 17:10; Luke 16:15; 1 John 3:20), and knowing all future events before they happen (Isa. 41:22-23; 42:9; 44:7; 46:9-10; Mark 13:32), as all of the predictive prophecies in the Bible illustrate. Third, God is omnipresent, or all-present. Since God brought the universe of space-time into existence, he transcends or supersedes its spatial limitations without being excluded or shut out of his own creation. This means that God can be and is personally present at every location in the universe without being localized or limited to one place at a time. The idea here is not that God is diffused or spread out everywhere like air filling a room, but that God’s presence fills the whole universe because he is its infinite, transcendent creator. Thus, the Bible teaches that God is indeed present everywhere (Ps. 139:7-10; Acts 17:28), that the universe cannot contain God (1 Kings 8:27; Isa. 66:1; Acts 7:48-49), and that he fills all things (Jer. 23:23-24). If God is the creator of the space-time world and everything in it and is personally present everywhere at once, then it follows that God’s being is incorporeal—that is, not embodied or enclosed in a body. According to the Bible, God is transcendent spirit (John 4:20-24) and not a man (Num. 23:19; 1 Sam. 15:29). This doesn’t prevent God from assuming or manifesting himself in a physical form if he chooses or becoming incarnate as a human being, as the Bible says he did in Jesus Christ (John 1:14; Col. 2:9); it simply means that a body is not part of his intrinsic divine nature. Finally, the Bible teaches that God has always had these attributes and always will have them. In this sense, God is unchanging or immutable (Ps. 102:26-27; Isa. 51:6; Mal. 3:6; Rom. 1:23; James 1:17). This is very good news indeed for those who trust him, because it means that God is absolutely trustworthy. We can depend on him now and forever to be what the Bible reveals him to be. He is therefore indeed worthy of our unreserved worship, honor, and praise. Grudem, Wayne. Systematic Theology: An Introduction to Biblical Doctrine, 141-225. Leicester, England: Inter-Varsity Press; Grand Rapids: Zondervan, 2000. Pink, A. W. The Attributes of God. Grand Rapids: Baker, 1975, 2006. Classic, short devotional study of the nature of God. Summary: According to the Bible, God is a unique being who created, sustains, and rules all things, and who therefore is the only proper object of religious devotion. He is personal, morally perfect, eternal, omnipotent, omniscient, omnipresent, incorporeal, and immutable.